ENANTHATED 1-DHEA gets most of its effects from conversion to 1-androstenediol, which has potent muscle building and hardening effects in and of itself. ENANTHATED 1-DHEA does not convert to estrogen nor does it activate the estrogen receptor like DHEA is known to do. It could be referred to as “dry DHEA”. Because of this, it will stack well with other estrogenic steroids such as 4-DHEA to produce† clean gains in muscle tissue. As with the other DHEA isomers, ENANTHATED 1-DHEA is naturally occurring and non-toxic. Side-effects such as oily skin, reduced fertility or increased hair shedding are considered mild and temporary. The most notable side-effect would be suppression of natural testosterone production, which makes PCT necessary after a cycle. This makes ENANTHATED 1-DHEA a very safe, legal and effective lean muscle building agent. Some users have reported lethargy with ENANTHATED 1-DHEA. This seems to be less severe when balanced with ENANTHATED DHEA or ENANTHATED 4-DHEA which tend to have an anti-lethargic effect. 1. 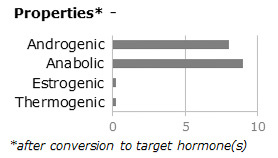 17beta-hydroxy-5alpha-androst-1-en-3-one (1-testosterone) is a potent androgen with anabolic properties. A Friedel, et al. Toxicol Lett, Aug 2006; 165(2): 149-55. Use in cycles of 4-8 weeks only, and take 8 weeks off in between cycles. So this product is the same as Blackstone Labs Chosen 1 I am guessing correct? No idea but it wouldn't surprise me. BSL has been copying the CEO of IML for years now.